USS Astoria (CA-34) steams by USS Yorktown (CV-5), shortly after the carrier had been hit by three Japanese bombs on June 4, 1942. 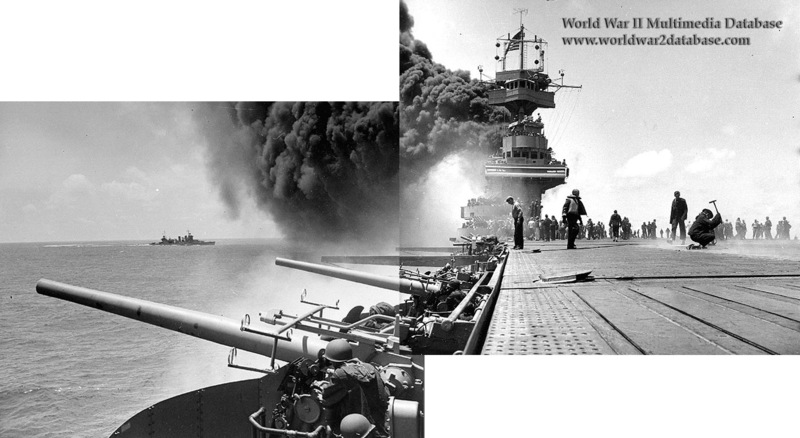 Dense smoke is from fires in Yorktown's uptakes, caused by a bomb that punctured them and knocked out her boilers. Taken from the starboard side of the flight deck, just in front of the forward 5"/38 gun gallery. Man with hammer at right is probably covering a bomb entry hole in the forward elevator. Note arresting gear cables and forward palisade elements on the flight deck; CXAM radar antenna, large national ensign and YE homing beacon antenna atop the foremast; 5" dual-purpose guns, .50 caliber and 1.1" antiaircraft guns manned and ready at left. Note open sights on the guns and splinter shield plates, fastened together with bolts. Projecting bars beyond the gun barrels are aircraft parking outriggers.